There is some question as to exactly how The King and I came to be written. In his autobiography, MUSICAL STAGES, Richard Rodgers stated: ""For the first time in our career, a project was submitted by someone who wanted to play the leading role, Gertrude Lawrence."" 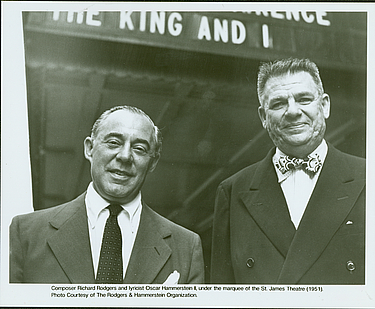 Rodgers & Hammerstein historian David Ewenwrote: ""Rodgers & Hammerstein's respective wives read Margaret Landon's novel soon after its publication in 1944. They suggested it to their husbands for a musical play."" Hugh Fordin in GETTING TO KNOW HIM, his biography of Oscar Hammerstein II, says the idea was Fanny Holzman's, ""the shrewd theatrical attorney"" who represented Gertrude Lawrence. Lawrence's husband, Richard Aldrich, wrote in MRS. A that ""Gertrude and Fanny had made tentative plans... They had secured a composer, an exceedingly well-known one who had provided the score for one of Gertrude's big London hits."" SheridanMorley called the question in his biography of Lawrence when he wrote ""Gertie suggested Cole Porter, who seemed less than enthusiastic."" And there is a first edition copy of ANNA AND THE KING OF SIAM here in our office with a note inside from the well-known agent Helen Strauss saying, ""Bennett Cerf tells me he talked to you about [this book] as a possibility for a musical. Let me know what you think of the idea."" Is a puzzlement? Wherever the idea actually came from, one thing is certain: THE KING AND I was written around, and for, the character of Anna Leonowens. Hers were the memoirs (two lengthy tomes) which were novelized by Margaret Landon into ANNA AND THE KING OF SIAM, which, in turn, inspired 20th Century Fox to make a movie in 1946 starring Irene Dunne and Rex Harrison. Then somehow, out of all of the above, a musical was created for a star. Even its title reflected that focus: the third person title of Margaret Landon's novel was changed to the first person -- The King and I. But let's not forget The King. He may not have started as a natural lead of a musical, but the fact that he and Mrs. Anna were so different made for an intriguing story. And a love story, to boot. 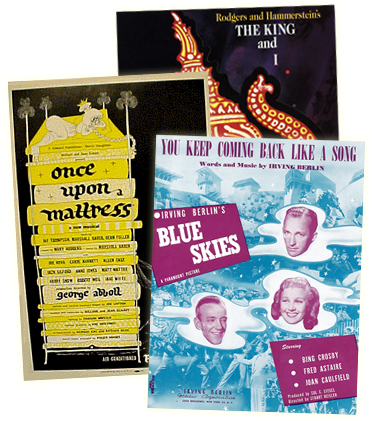 Rodgers & Hammerstein were good at creating musicals in which opposites attract. They had already shown their ability to write for characters who, although obviously drawn to each other, cannot and do not express their feelings directly. Mrs. Anna is an employee -- and hired by none other than a King. She stands up for herself when she feels she must, which throws stumbling blocks in the way of any relationship between them. He is fascinated by her, but why is sometimes hard to fathom. That they are attracted to each other, however, is clear, making for an irresistible, if challenging dramatic scenario. A glimpse at an early pre-rehearsal script gives some insight into just how delicate the construction of the story was. Here is the way Hammerstein described the ""Shall We Dance?"" scene, generally accepted as the apotheosis of the relationship between Mrs. Anna and the King of Siam:"" Anna tries to explain the Western idea of the love of one man for one woman. It will introduce a new song, which will be Anna's attempt to describe a romantic love totally foreign to the King's idea of relations between man and woman. In his part of the song his logical arguments against sentimental monogamy must be a difficult one for Anna to answer. She can only fall back on the fact that in the Western world, this thing which seems so foolish and impossible to him is happening every hour of the day, every day, and a man and a girl are falling in love, believing that they are the only people in the world for each other. At the end of the song, while he does not admit that he is convinced to any degree, it is apparent that he has found her very attractive and somehow can feel this illogical impulse himself, however vaguely."" At first glance, ""Shall We Dance?"" appears to differ from this description. The one song became two, her part doesn't ""describe a romantic love,"" he doesn't present ""logical arguments against sentimental monogamy,"" etc. And yet, the finished scene and song, written in the third person (""...a young girl at her first dance..."") creates a situation in which an innocent act of teaching a polka -- surely one of the least romantic of all dances becomes a statement of passion. By the time this sequence was written, Rodgers &Hammerstein must have felt the King's ""illogical impulse"" need not be ""however vague"" -- it could actually be quite bold! They also succeeded in capturing in this one brief sequence, the summation of a complicated relationship between a strong-minded man and an equally strong-minded woman.It's all there. ""As Chulalongkorn continues, Anna has come closer to the King. She touches his hand. He does not stir. The music swells. Impulsively Anna sinks to her nees and kisses his hand. The smile has not left the King's face. Maybe he is only asleep -- there is no way of telling. If his busy life has finished, he has left it with a sense of security for his people, for the new King,Chulalongkorn, has Anna."" One glorious touch, evident on the superb new cast album made of the current London production, was added when the decision was made by the authors for the King to die. It is Chulalongkorn's line, and it is uttered when he sees his mother, Lady Thiang, bowing to him, a bow that signifies Chulalongkorn is now the King. In a plaintive voice he asks: ""Mother?"" And long live The King and I. There is something about the musicals of Rodgers & Hammerstein that speak to each successive generation. After all,the R&H musicals are about people and people don't actually change as much assome might think. Our foibles, our hopes, our fears, our concerns, ourpoints of view, our vulnerabilities are all somehow examined in this body ofwork. And this was never more true than in The King and I. It was the enduring quality of this musical that seemed to amaze even one ofthe two people who created it. After attending a charity screening of themovie version in Melbourne, Australia in 1956, Oscar Hammerstein II wrote to Richard Rodgers: ""I am convinced that this is our best work. I have a kind of humble feeling of not knowing how we did it. It has more wisdom as well asheart than any other musical play by anybody. It will remain 'modern' long after any of our other plays."" After being restricted for several years, The King and I is currently available for performance. For perusal material and further information,please contact The R&H Theatre Library, 229 West 28 Street, 11th floor, NewYork, NY 10001...Tel: 212-564-4000; Fax: 212-268-1245; e-mail: theatre@rnh.com... Applications and perusal requests may also be processed on-line atwww.rnh.com... Our school customers will soon be getting details about ournew program of musicals for elementary and junior high school students; the""G2K series"" will commence with GETTING TO KNOW...The King and I.